Roku has released version 1.1 of their iOS remote control app. When the app launched last December, the control interface was focused on using swiping gestures for navigating through the Roku’s onscreen interface. The new version adds a more traditional D-pad and control buttons layout. 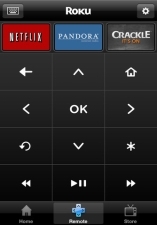 The new version also adds shortcuts to Netflix, Crackle, and Pandora above the D-pad controls. Unfortunately, although the app allows the user to launch directly into channels, there does not appear to be a way to customize the shortcuts above the D-pad to house one’s personal favorite channels. Finally, the updated app brings improved device discovery and a shortcut for switching between Roku accounts. Roku is also promising that an Android version is on the way. You asked—we listened. Today, we released an update (version 1.1) to our iOS app. The update adds a more traditional layout with “D pad” buttons along with shortcuts for Netflix, Pandora and Crackle. So you’ll always be a click away from your favorite channels. ‘Roku Remote’ for Windows Phone is great!! I hadn’t heard about anyone putting together Roku remote control apps for WP7. Roku Remote does look nice. There is a free version, but really, $2 to get rid of the ads…? Just based on the screenshots, I think Roku Remote is the best looking of the group. Anyone have any feedback based on their experiences?